My backhoe blew a hydraulic hose on the swing cylinder. Of course it was late Saturday and the dealer is closed until Monday. The hoe is fully extended and swung to the right. Is there workable way to patch the hose well enough to get it centered and retracted so I can remove the hoe and use the bucket until the dealer opens on Monday? If you have a grease hose you might get that in there provided you have fittings to adapt. 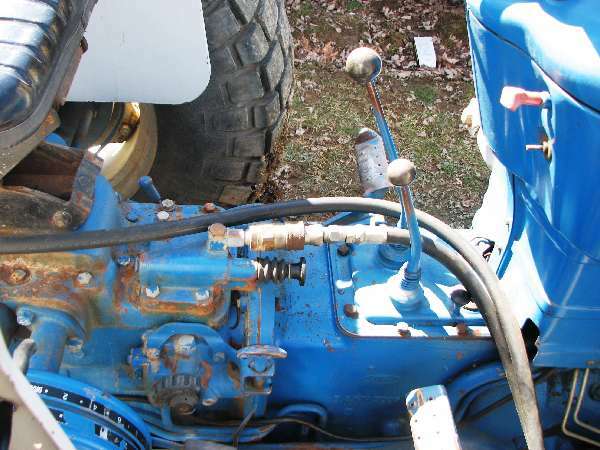 Will a hose on the front end loader work? If nothing else you could try a piece of tubing and a couple of hose clamps. If it's a hole, you can lock a temporary patch over it with clamps and tape. If the hose pulled out of the fitting, I don't think so. Thanks, guys. I thought due to high pressure a simple patch or hose clamp affair might fail in the first few seconds, but it will only take 20 seconds or so to get the hoe centered and retracted so it can be removed. It failed in the middle of the line, not at the fittings. KW: You gotta make this harder---this is a no-brainer, buddy! You'll need a CLEAN bucket with a lid and (2) CLEAN pieces of garden hose that will clamp over the broken hose. If the hose is only punctured but not separated--sever it now. You'll also need a ratchet strap(s) or other securing device to keep the boom from swinging once you get it centered. And I'll need your credit card number and exp. date (Christmas is coming). Install and clamp a garden hose piece each piece of hydraulic hose of the swing cylinder. Place the hoses in the bucket with a lid--place the hoses through the spout or bung opening and secure/clamp them so that they don't blow out later. The bucket can be hung on the machine or left on the ground providing there is enough hose when the machine is raised. Then, simply start the machine--be sure there is no pressurized fluid going to the broken hose--if there is (but shouldn't be)--turn it off! Lift the front bucket off the ground to allow the tractor to able to tilt. Raise/tilt the machine using the downrigger that is nearest the dipper stick. You probably won't need to raise it more than 6" or so. The dipper stick should not be touching the ground. Now, CAREFULLY operate the swing control lever until the dipper stick is where you want it and release the lever. Use the ratchet strap(s) to secure the dipper stick. IMHO I would strap it from the bucket on both sides then back to each downrigger to gain a larger triangulation which equals better leverage/resistance against swinging. Start the machine, raise the dipper stick, raise the downrigger. Remove the temp. hoses and dispose of the old fluid in the bucket. And like you told me---ah-hemm...be sure to get it on VIDEO! But... I didn't know that NAPA makes hydraulic hoses. Since they're open on Sundays it was a no-brainer to get a new one from them rather than wait for the dealer to open. The NAPA hose is a heck of a lot more rugged than the Parker hose that was installed by the factory, and at $35 it was probably cheaper too. Twice the wall thickness with spiral metal spring armor around the outside. It's NAPA from now on for all my hydraulic hose needs. BTW, Parker is one of most respected hose and fitting suppliers there is (IMHO). Gates is another. All hydraulic lines are not created equal. Robust doesn't necessarily equate to quality or even strength. Pressurewise, it is the number of "wires" or layers of braided steel inside typically 2 or 3 that dictate that (For this context. More or less wires are out there). It used to be that 2500PSI was common or the max on construction/farm equipment. Then it became 3000 PSI, and recently 4,000 and higher is/will be becoming the norm. Around my 'hood the first thing a line maker asks is "what is the pressure?" (2,500 for most is the cut off point). If you don't know, they automatically assume it is higher and you get a better hose. And keep in mind that a thicker hose may not have the same flexibility or ability to make a small radius like a thinner hose might---which can be critical sometimes. And thicker hoses require larger diameter and usually longer ferrules or fittings which can sometimes be space-prohibitive---been there. Done that. All I know is the NAPA guys said "Parker hoses are the economy brand". They seemed very knowledgable, recommended Weatherhead brand, and made a nice armored hose for me. The Parker was rated for 3250 psi and the Weatherhead is 5000 psi. Don't know about burst ratings. The crimp fittings on the NAPA hose are thicker, but it doesn't matter because a line wrench wouldn't fit around the Parker fitting either. The NAPA fittings are a much harder grade, since they didn't want to round off with a standard open-end wrench like the factory hoses. Yes, the NAPA hose is a bit less flexible but it doesn't need to flex much and works fine. The original hose burst because it got pinched between the swing cylinder and the fitting on the end of it's shaft (poor hose routing by the factory or dealer). Ken, sure no hyd hose expert but wonder if all NAPA stores use the same supplies on those? At same time many companies do have different grades of a product, even with their name on it. Take Michelin for instance. They have their famous tires and then some OEM tires recaps as about as good as.